The TAC READY BigBoost 16 inch high gain whip antenna is great for use on federal wildland fire incidents. Specifically tuned to use in the 161-174 MHz range and optimally function on federal tactical repeaters and incident simplex channels. 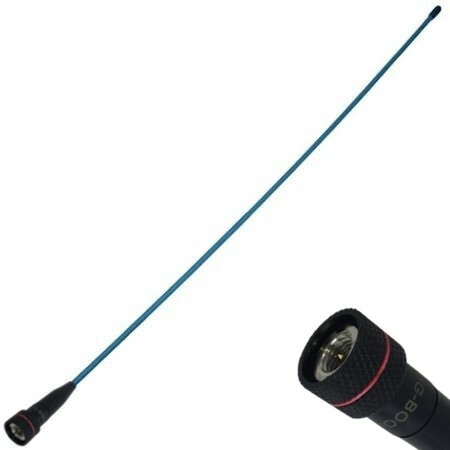 This VHF antenna comes with an SMA-Male Connector has 2.15dB gain to get help transmit almost twice the distance as a standard rubber ducky antenna. Federal wildland incidents most commonly use frequencies in the 163-168 MHz range for tactical ground opperations frequencies. The TAC READY antenna is designed to function best for these federal frequencies. This antenna is designed for USFS, BLM, BIA, NPS, USFWS, wildland contractors with the USFS, Wilderness Rangers and federal agency employees. The BigBoost ANKNGWPBB16V TAC Ready antenna for the BK Radio KNG P150 Radios is tuned for use within the range of 161-174 MHz. This antenna would not be the recommended antenna for use at 142 MHz as that is outside of its range. This KNG Whip antenna if fully flexible and comparable to that of the Bendix King LAA0813 for the DPH, GPH, EPH Portable radios.